Decline – Decline is the name given to one of the more mysterious diseases affecting boxwoods. It causes their leaves to turn yellow and drop, their branches to die randomly, and their wood and root crowns to form sunken cankers. Decrease the likelihood of decline by cutting back dead branches and removing dead leaves to encourage air circulation. 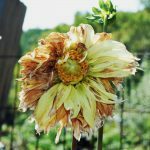 Don’t overwater during the summer, but provide enough water before the frost to give the plant the strength to survive the winter without damage. 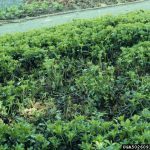 If decline occurs, don’t plant new boxwoods in the same spot. Root rot – Root rot causes the leaves to lighten in color and the roots to darken and rot. There is no boxwood disease treatment for root rot, and it will kill the plant. 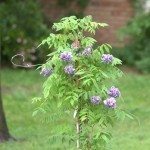 Prevent it by planting resistant plants in well-drained soil and watering sparingly. 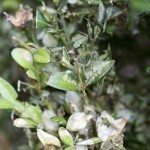 Boxwood blight – Blight turns leaves spotty and brown, and may cause them to drop. It also forms cankers on the wood and, in wet conditions, white fungus all over. Cut away and dispose of affected branches and leaves. Put down new mulch to prevent spores from splashing up from the soil, and apply fungicide. Nematodes – Nematodes are not so much diseases in boxwood as microscopic worms that eat through the roots. Nematodes can’t be eradicated, but watering, mulching, and fertilizing regularly can keep them in check. Volutella canker – Also known as volutella blight, it is one of the boxwood bush diseases that makes leaves turn yellow and die. It also kills stems and, when wet, produces masses of pink spores. The boxwood disease treatment in this case consists of pruning back dead material to increase air circulation and applying fungicide.